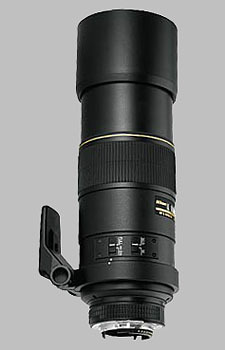 (From Nikon lens literature) Compact super-telephoto lens for travel, sports, wildlife and stock photography. Super fast, super quiet lens using Nikon's Silent Wave motor technology. M/A switch for fast transitions from AF to manual focus. No power drain when manually focusing. This is a great lens, a really great lens. Sharpness is excellent from f4 and only gets marginally better at f5.6 to f8. No Chromatic Aberration or Color fringing. AF is fast, but not like newer generations AFS. AFS gets better with latest body's like D700 or D3, never lightning speed however. Vignetting is very acceptable on FF-camera's. Use this lens with the Nikkor TC14E II and you won't see any significant loss of image quality. Great combo !! Tripod feet: replace it by one from Kirk, this is really terrible! Really needs a tripod for the sharpest shots ... but the foot is the weak link. I've had mine on my camera with a Nikon 1.4 TC (for a 420 mm total) for the best part of a year. (There is no optical penalty with this TC - Lens combo!) It is an absolute joy for birding - although 2.8 would be a lot nicer - and way more expensive. It is also great for macro shots. I only gave it an 8 for construction quality, because the tripod collar and foot are simply flimsy. (I think the flex is in the collar rather than the foot.) I've wedged a cork into the foot to stabilize it, and this modification definitely creates far sharper images. Unfortunately, the Kirk or Really Right Stuff collars are clearly better fixes, but for now the cork will do. In summary: except for the foot - this is an incredibly satisfying lens, and I would buy it again in a heartbeat! I started to use this lens this summer for Macro. In combination with the PN-11 extension tube and the D200. And with a solid tripod and use of MLU. With the lens plus tubes you can keep a safe distance which is nice while approaching dragonsflies and damselflies. I replaced the collar because Kirk's is better. I don't think it is needed if you shoot above 1/60sec. I have to say that after some practice the results are really great. It is as if you use a supertele (I own the Sigma 300-800) for macro. Pictures look different than the 200mm f4. This is a killer deal for a 300mm prime. I have had this lens for two years and love it. Originally it was my solution to not being able to afford the 2.8 glass, but since its size has really grown on me. It is so small and portable, but just as sharp as it's 2.8 big brother. It excells at sports and bird photography, and performs very well with the TC1.7II, giving you a focal length of 510mm, plus the 1.5 DX crop factor and you're at 765mm for less than $1500. Excellent budget solution to bird photography. The focus is extremely fast, and even functions well with the 1.7TC. Awesome lens all around, the only thing that I've ever wanted was for it to be a 2.8 or to have VR. But you have to pay for those things! I've had this lens for six years. I use it for high school football and some wildlife shooting. In terms of sharp images and quick focusing, it consistently beats my Nikon 70-200 f2.8 VR. I shoot digital, so this lens is the equivalent of a 450mm lens; so I have limited opportunities to use it. I'm very happy with this lens and have no regrets about losing the two stops over the 300mm 2.8. In my opinion it's a great value and a great lens.